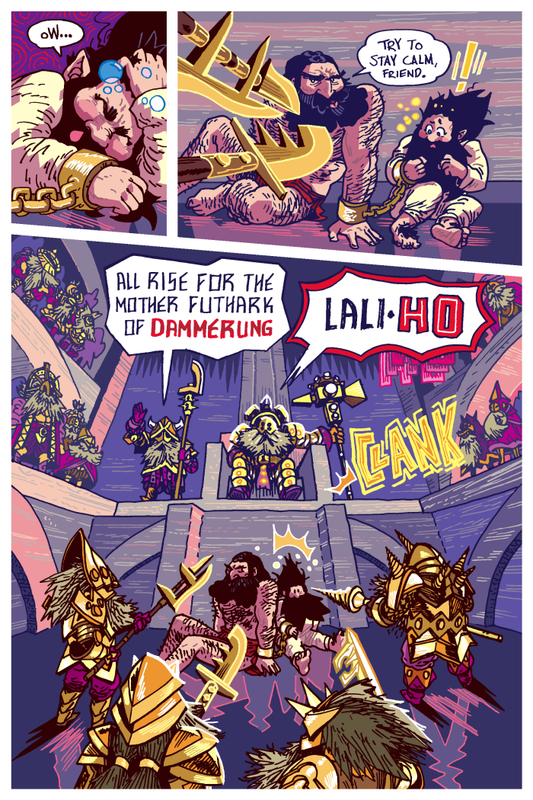 Also, I only see dwarves with beards in the past two pages. I wonder if they’re all women? Lali-ho! That’s a reference I haven’t thought about in a while. Oh man. She Dwarf is a total trouble magnet, but she’s a dwarf so maybe just maybe she can talk her way out of this? I mean, she did want to meet other dwarfs and she did manage to become friendly with her elf assassin. I feel like I missed something somewhere. Suddenly… Dammerung. Mother Futhark?! Is that supposed to be funny or did it just come out that way? Does Mother Futhark mean something different than I think? It’s a play on the “Elder Futhark” with is the Norse Alphabet of runes.